The ContinuuMini will be available for sale in Summer 2019. Retail price (USA) of ContinuuMini will be $899.00. We are very proud of how we have been able to leverage our decades of hardware and software expertise into the ContinuuMini. The ContinuumMini fulfills a need for a small portable musical instrument that is intimate and expressive. In the video below, Edmund Eagan plays a variety of ContnuuMini presets. He is using the Onde resonator from La Voix du Luthier in place of a loudspeaker, to further enhance the acoustic-like playing experience. The ContinuuMini’s synth engine is up to 8-voice polyphonic, but its playing surface can detect only one (or, in a limited way, two) fingers at a time. When you touch the surface with two fingers, it can detect the two pitches each with independent bend/slide, but only one overall pressure. The polyphony you hear comes from different things depending on how the preset is programmed: it can be from notes that decay a long time after you release your finger, or from sustain pedal, or from internal sound generation based on notes you played in the past. The ContinuuMini has great sensitivity, but not the same playing surface feel as the Half-size and Full-size Contiunuum Fingerboards. The ContinuuMini’s pitch accuracy, pressure sensitivity, and fast response makes it a super-sensitive instrument. But the ContinuuMini does not feel like a tiny Continuum Fingerboard. 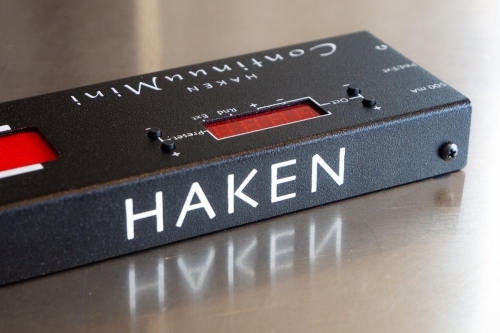 It has its own unique playing surface feel: the Continuum Fingerboards have an advanced Hall Effect Sensor playing surface; the ContinuuMini has a Hybrid Hall Effect/Strip playing surface. Still, the ContinuuMini combines great sensitivity and the EaganMatrix sound engine, and that is essential – with that combination, different kinds of playing surfaces will be able to make good player-in-the-timbre-feedback-loop experience. It is a bit like in the acoustic world, where so many different woodwind, brass, and string instruments all have high sensitivity each in their own way, so each can make uniquely amazing music. All the MPE controllers I know of use the "MPE Strike" (which is the exact same thing as "Midi Key Velocity") to represent the whole of the attack trajectory of a note. Most EaganMatrix presets are designed assuming much more information about the attack trajectory (not just one 7 bit number), so while the presets will play, they won't sound the same as they would with a ContinuuMini. In Edmund Eagan’s ContinuuMini introduction video, he uses the xKey in one part of the video -- the xKey is not itself an MPE controller, but MPE specifies that channel 1 can have "traditional Midi" polyphonic notes on it. In the example, the ContinuuMini is set up to expect MPE in, so this works since polyphonic-Midi-on-channel-1 is subsumed in the MPE standard. We strongly recommend you use HOSA MHE-100.5 to adapt the ContinuuMini’s 1/8th inch TRS to your pedal’s quarter inch TRS. The HOSA MHE-100.5 does a good job at strain relief (because of its right angle design) and it is available in many on-line stores. The ContinuuMini is designed specifically for the Yamaha FC7, FC3/FC3A, FC4, and FC5 pedals (for details navigate to Support then User Guides on this web site; the Continuum User Guide has a section about pedals). We chose the Yamaha pedals because they are well-built and inexpensive and available everywhere. The FC3A (or FC3) is especially nice: it is continuous-valued and return-to-zero. Other brands of pedals will work if they are electrically equivalent to the Yamaha. Yes, the ContinuuMini will interface well with most DAWs. Edmund Eagan (the inventor of the EaganMatrix) uses Logic Pro with his ContinuuMini and his Continuum. Be sure you select a DAW (like Logic) that supports recording on multiple Midi channels simultaneously, critical for recording Continuum Midi (or any MPE Midi for that matter). Ed has used Logic to record Midi from the Mini and play it back into the Mini again, and it all works fine. You can play into any MPE-capable Midi synth. (1) The Mini’s sound engine has been specifically designed for Mini performance data. It’s a nice marriage. (2) Recording audio in modern DAWs still means you have a lot of post-processing flexibility. You can still transpose, quantize, and otherwise process the audio like it was Midi data. (3) If you use a Midi performance from the Mini for another Mini preset, you may get less-than-desirable results, because each preset requires a different playing technique. You won’t perform a “saxophone” preset like a “marimba” preset. Switching presets makes a lot of sense for Midi keyboards or MPE controllers that have low bandwidth information, because it is the same to play any preset -- but for the ContinuuMini your finger motions are controlling timbre details, and those motions won’t make sense with a different preset. … Still, it may be useful to try as there can be some happy accidents. (4) Quantizing in a DAW does not respect the timing relationship of continuous controller events and the note placements. I believe only Steinberg’s Cubase can do this (tie performance cc lines to notes). So if you move a note, your other performance parameters don’t change in time. So in that sense you lose the flexibility in moving Midi data. (1) ContinuuMini and xKey powered and connected through a computer running the Continuum Editor. (2) Use a USB host that can pass the Midi data from the xKey into the Continuum – not a generic USB hub, but a Midi-hosting hub. No. 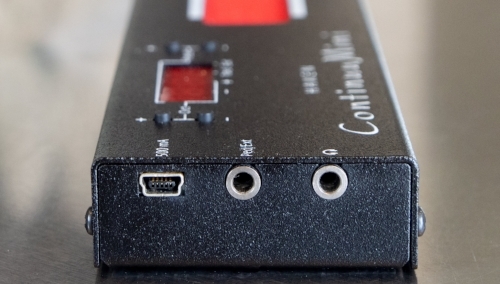 At this time, the ContinuuMini only has USB-Midi. There over 300. The presets correspond to those included in a Full-size and Half-size Continuum Fingerboard, but most are modified for the different playing experience of a ContinuuMini. (1) The Continuum Editor is nonfunctional unless you have a ContinuuMini (or Continuum) hooked up. The Continuum Editor is really just a user interface for what is inside your ContinuuMini. (2) The EaganMatrix is a revolutionary new way to design sounds, and will require new skills and learning. For an introduction, please watch Loopop’s and Cuckoo’s videos (https://www.hakenaudio.com/introduction-videos). (3) More detail about the EaganMatrix is available in the EaganMatrix User Guide (https://www.hakenaudio.com/user-guides), and Richard Kram’s EaganMatrix Programming YouTube channel (https://www.youtube.com/channel/UCbLVeRNRaGubdyhHGkCn5tQ/videos). The ContinuuMini has three dimensions “X, Y, and Z” like the big Continuums, except on a much more limited scale. On the ContinuuMini, the “Y” dimension corresponds to the ability to rock the playing surface so the near side or far side is higher. This "Y" dimension is much less precise than the "X" (pitch) and "Z" (pressure) dimensions, but it is useful for things like overblow effects on wind-like sounds. You will want to use a cable like HOSA CMR-206. But you may also need a Ground Loop Isolator; please see the FAQ on that topic. You will never need an Isolator while you have headphones plugged into your ContinuuMini. But when you connect your ContinuuMini to your home stereo, or a studio amplifier, or an a/d converter to your DAW – then you might need an Isolator. Only use an Isolator if you need it – try the connection first without Isolator – if it sounds good, great! If you hear noise, then insert a Ground Loop Isolator. More technical details, in case you are interested: You want one and only one ground connection between the ContinuuMini and whatever you connect it to. For headphones and battery-powered speakers, the audio cable provides this one ground connection. But in a home or studio setup, there might be multiple ground paths. While USB connections are convenient, they are not ground-isolated like traditional DIN-5 Midi, so it is easy to get ground loops. If you hear ground loop noise, it is easy to fix: use an Isolator. If it sounds good without an Isolator, avoid using an Isolator, as it may remove the only ground path. Typically isolators consist of two matched transformers, one for the right channel audio and one for the left channel audio. Yes, you can play the ContinuuMini vertically. You can run the USB cable along your strap to a battery along with the audio cable. You might want to get USB and audio cables with right-angle connectors to make them neat and compact on stage. If you decide you want to play with your thumb on the backside of the Mini, there are cutouts in the sticker on the back side that you can feel with your thumb and use for reference positions for your hand. We call the cutouts “Mouquets”, for Deep Forest’s Eric Mouquet who gave us this idea. We love the idea of playing this way, but until we see people do it we do not know if it will be easy! Yes! You will want to place your thumbs on Moquets on the underside to keep your hand position reference as you play. (Mouquets are cutouts in the sticker on the back side of the Mini that you can feel with your thumb and use for reference positions for your hand. We call the cutouts “Mouquets”, for Deep Forest’s Eric Mouquet who gave us this idea at ContinuuCon 2018.) If you are in a DIY mood: It may be possible to connect your breath controller to the Ped/Ext input in place of a pedal. That depends on the the voltage range of your breath controller, and on an 1/8th cable connection to the Continuum. If it works, you will want to customize sounds for it because it will not be the same range or feel as a pedal. You might like the "Alvin MT25-CL". You can also use a 2.5 inch diameter mailing tube (24 inches long) with screw-in endcaps.